The Avocent AMX5020 KVM switch is a 4x42 appliance with a field-proven scalable architecture that easily accommodates additional servers and users. The AMX5020 matrix switch allows simultaneous access, supports multi-platform server environments and provides non-blocked access to servers. 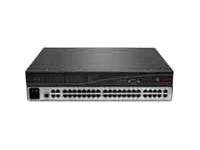 The AMX5020 switch includes the AMWorks Java-based system management tool.